On February 24, 2011, an unknown suspect knocked on the front door of the residence located at 920 SE 17th Terr. Cape Coral, FL. A female victim responded by opening the door and was met by an unknown suspect. The suspect was wearing clothing described by the victim as being similar to a police uniform. The clothing was described as a short sleeve shirt, black in color with what appeared to be police type patches on the sleeves. The victim stated that the suspect did not have any badge or name tag that was visible on his person. The victim stated that the suspect had a police duty type belt around his waist with what was described as a semi-auto handgun. According to the victim, the suspect inquired about issues in the neighborhood and he never identified himself as a law enforcement officer. When she turned around, the suspect grabbed her by the hair. A struggle ensued and the victim was able to break free and run to her bedroom. The victim located her handgun and fired two rounds at the suspect. The suspect fled out the back door towards an unknown direction of travel. 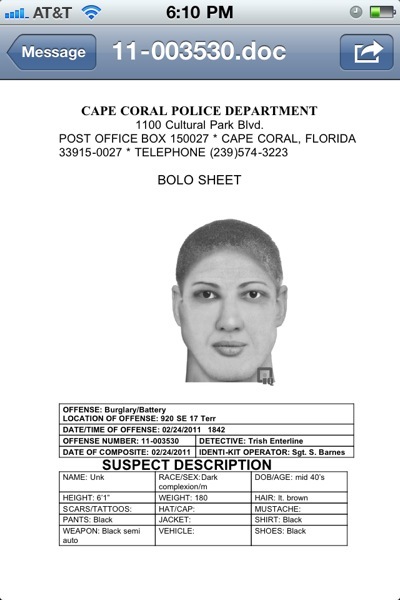 Anyone with information may contact the Cape Coral Police Department at (239) 574-3223 or Crime Stoppers at 1-800-780 TIPS. Got a tip on a crime? Call Southwest Florida Crime Stoppers at 1-800-780-TIPS. If your tip leads to an arrest or recovery of stolen goods, you could be eligible for a cash reward of $1,000.